Job growth continued at an impressive pace in June, beating expectations for the second consecutive month. Trucking hires also made significant strides during the month, but increased competition from within transportation and other competing industries will remain a challenge going forward. The Bureau of Labor Statistics reported that the economy added 213,000 workers during the month, down slightly from a downwardly-revised gain of 244,000 in May. This exceeds consensus estimates of 190,000 and serves as a sign that labor demand remains robust in the economy, despite rising concerns of tariffs sapping some momentum from the economy. Employment growth during the month was led by large gains in the service sector, where large gains in professional services and health care helped to outweigh declines in retail employment. Manufacturing employment continued to improve in June, as 36,000 workers were added to factory payrolls. Despite the healthy job gains, the unemployment rate ticked up in the economy, rising to 4.0% from a 50-year low of 3.8% in the previous month. Over 600,000 people rejoined the labor force in June, pushing the labor force participation rate up to 62.9% and accounting for the increase in the unemployment rate during the month. Wage growth disappointed in this morning’s report, however, rising just 0.2% from May’s levels. Average hourly earnings growth remained stuck at 2.7% year-over-year, and has failed to gain any significant momentum despite the strong job growth seen throughout the year. Trucking hires rose for the second consecutive month in June, as the number of trucking employees rose by 2,500 during the month. This comes on the heels of a downwardly-revised 3,600 job gain in the previous month and marks the ninth time in the last ten months that trucking employment has increased. The number of trucking jobs is now 1.7% higher than at this point last year, which slightly exceeds the 1.6% pace in the entire economy and is the fastest rate of growth in trucking hires since the 3rd quarter of 2015. The improvement in trucking hires serves as a sign that capacity is slowly beginning to come back to the market. Still, the industry is likely to face a capacity crunch, as this pace of hiring is not enough to keep up with the rapid growth seen on the goods side of the economy. Trucking has faced demographic challenges for years now, with an aging workforce that has been hit hard by retirements. Recruitment of new drivers to backfill these retirements is likely going to remain difficult. Competing industries such as manufacturing and construction are also growing in the economy, and are also scrambling for workers to fill available positions. Jobs in these industries offer competitive salaries, require similar amounts of training, and often offer better lifestyle options as compared to over the road truckers. In addition, the rise of e-commerce has led parcel carriers such as UPS and FedEx to step up their own recruitment of drivers for small package deliveries. While hiring for truckers stagnated for years and has only recently begun to improve modestly, hiring among couriers and messenger services, which includes the parcel companies, has surged. Employment growth among these companies has averaged nearly 6.5% every year since the start of 2015, while trucking hires have averaged just 1.0% growth during that time span. When taken in aggregate, trends in overall drivers entering into the labor force have not changed much over the past few years, but it appears that fewer drivers are deciding to go the route of an over the road trucker when choosing their career. Younger drivers may find the quality of life more appealing as a parcel worker, where a driver gets to spend more of his/her time at home. With e-commerce continuing to surge in the economy, trucking carriers will have to compete harder to lure workers into the field. The jobs report this morning was generally positive, with the headline number combined with upward revisions in previous months serving as evidence that firms’ appetite to hire remains intact as we head to the second half of the year. 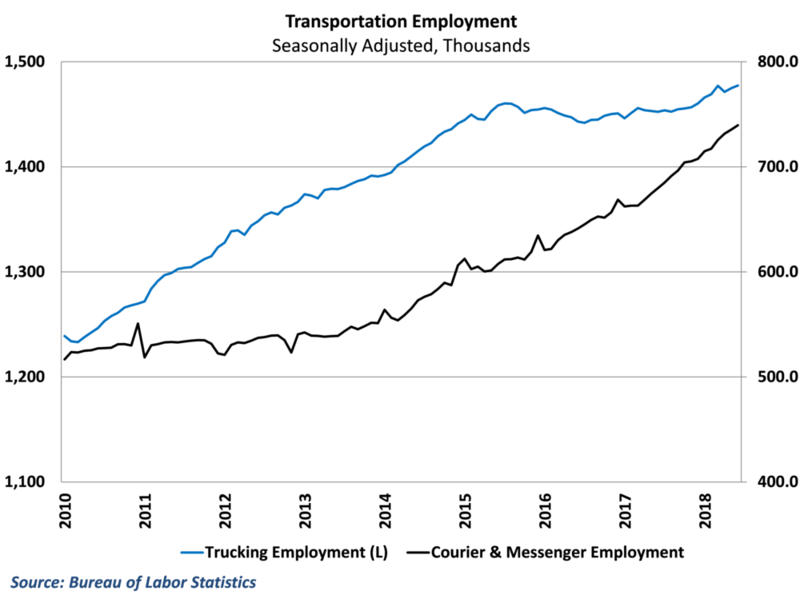 The expansion in the size of the labor force is also promising, as it signals that there may be some more room for strong job gains. As usual, the real disappointment has come from the wage growth figures. Earnings growth is now just barely exceeding inflation in the economy, which is creeping up around 2.5%. With signs of price pressures all over stemming from rising commodity prices and recently implemented tariffs, wage growth will need to pick up further to keep US households in a healthy position.